This chapter focuses on dataflow and (external) protocol access to the SE Platform via so called Application Programming Interfaces (APIs). See the Architecture and Data Management chapters for the overall design and data processing of the SE Platform. This section sketches the global dataflow and introduces the main APIs. Figure 1 above emphasizes the datastreams (red arrows) through the SE platform. Data eventually always originates from sensors, mostly within stations like Intemo Josene or EU JRC AirSensEUR. Sensors are shown at the bottom of figure 1. One of the first observations is that sensors do not send their data directly to the SE Platform, but push measurements to so called Data Collectors (drawn as squares). 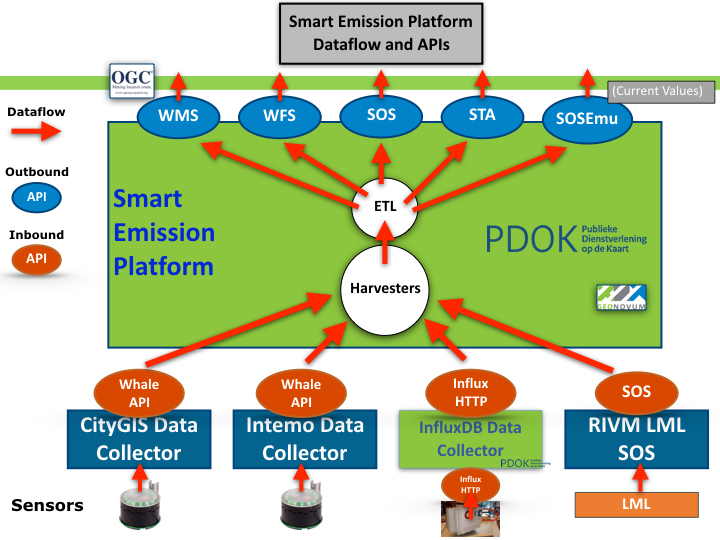 The SE Platform follows a pull model: data is continuously fetched from Data Collectors using Harvesters. Further following the flow of data, the ETL processes (as described in Data Management) will eventually push the refined (validated, optionally aggregated, converted and/or calibrated) data to various API services that provide (mostly standard OGC) Web APIs from which clients (e.g. Web Viewer Apps), even in theory another SE Harvester, can consume the data. There are two groups of APIs: Inbound (producer) APIs (in orange) and Outbound (consumer) APIs (in blue). In some cases the reason for an API-existence is historic: in the initial phase of the project, experience needed to be gained with multiple APIs. A short overview follows. These are the APIs through which Harvesters pull (mainly raw) data into the platform. Devices in this case are Josene Sensors that contain multiple sensors, which together provide over 40 indicators. The main classes are: gasses (for AQ), meteo (temperature etc), sound pressure (noise), GPS and misc data like light intensity. Mainly used for AirSensEUR (ASE). Each ASE (mostly hourly) pushes its data to a remote InfluxDB. Per ASE station a single InfluxDB Measurement (equivalent of a regular DB Table) is used. Just like the Whale API, InfluxDB also provides an HTTP API to query Measurements and thus pull (harvest) timeseries data. An InfluxDB instance can be remote or within the same server as the rest of the SE Platform. This also provides a means to couple a push-based model to a pull-based model. Data can be pulled from a remote SOS. For the SE platform this is used to pull in reference data from RIVM for the ANN Calibration learning process. See also the Calibration chapter. These are the APIs from which clients pull (mainly refined/aggregated) data from the platform. A WMS with plain image and time-dimension support is provided. This allows clients to fetch images through history (e.g. with a timeslider in a web-viewer). The WMS OGC Standard provide Dimension-support, in this case time as dimension. This provides a standard OGC SOS service: both the standard OGC versions 1 and 2, but also the 52North-specific SOS REST service. This provides the SensorThings API, with requirements as SOS, but implemented much more lightweight. In a nutshell: within STA an E/R-ike model of Entities (Things, Sensors, Datastreams, Observations etc) are managed via HTTP verbs (like GET, PUT, PATCH etc). NB the OGC STA standard also uses and integrates the IoT protocol MQTT. MQTT may be used in future SE Platform versions. SOSEmu (SOS Emulator) has been developed early in the SE project, when SOS was not yet available, and a way was needed to quickly gain access to (Josene) sensor data. This API provides quick access to the latest (refined) data (no history support of Josene devices and has no support for other sensor device types) of sensors. The main/only user is the SmartApp. SOSEmu is intended to be phased out.